iD Tech has understood the importance of engaging girls in tech since day one, when our founders, two Silicon Valley women, decided they wanted to create a new kind of technology education program. Since 1999, we’ve been working hard to make sure that girls love our camps as much as the boys. But shrinking the gender gap at camp, not to mention within the larger fields of science, technology, engineering, and mathematics, is no easy task. It requires the participation and support of many companies, nonprofit organizations, public figures, industry leaders, and everyday people. Knowing that it takes a unified effort to impact the way girls occupy the tech space, we are thrilled to announce our partnership with the Society of Women Engineers (SWE), a nonprofit organization that advocates for women in engineering and technology. iD Tech and SWE share a common goal of wanting to increase girls’ participation in STEM fields, and we know that together we can inspire a lifelong passion in these fields. With this partnership, we are looking forward to leveraging the decades of work SWE has done to encourage girls in engineering. Together, we can empower more girls through innovative summer camp experiences coupled with helpful post-camp resources, opportunities, and communities. Together, we will close the gender gap in STEM fields one inspired woman at a time. In 1950, more than 60 women engineers and engineering students gathered in New Jersey to formally create SWE. Today, the Society of Women Engineers provides support and resources to guide women through college and into their professional careers. Membership benefits include access to an online career center, webinars, scholarship opportunities, a monthly newsletter, publishing opportunities, a magazine, and much more. Over the years, iD Tech has made many strides to increase the number of girls at our camps. In 2001, we created a girls-only week of camp. 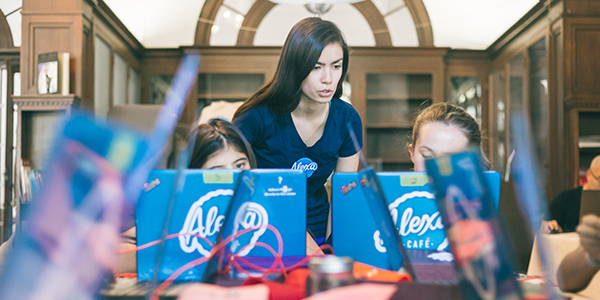 Nearly 13 years later we launched our unique all-girls summer program, Alexa Café, as one solution to the many hurdles that keep girls from pursuing STEM in school, college, and in future careers. After a sold-out inaugural season, Alexa Café has expanded to nine states nationwide. Anushka, an Alexa Café alumna, perfectly describes the impact of the all-girls technology program: “I love Alexa Café. Before I came here, I felt like technology was mainly for boys and that I couldn't do it. Now I realize I can do anything I set my mind to." Each week, we see campers leave on Friday with new skills, greater self-confidence, and a fresh perspective. Sure, we teach real-world skills like if-then reasoning, storyboarding, and level design, but we also foster an authentic passion for technology that lasts long after camp ends. Join us this summer and give your child a tech camp experience they’ll adore. Find a camp location near you or browse our comprehensive list of more than 60 tech courses. We hope to see your kids at camp this summer.